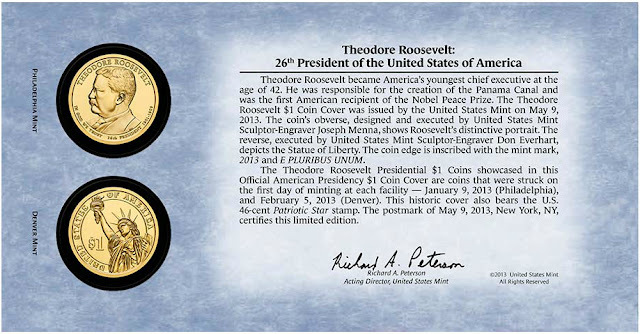 The 2013 Theodore Roosevelt Presidential Dollar represented the second release of the year for the series and the twenty-sixth release overall. The former President’s role in redesigning American coinage has particularly endeared him with collectors, prompting higher production levels for the issue as well as two special numismatic products. Before becoming President, Theodore Roosevelt held various offices at the city, state, and federal levels including Assistant Secretary of the Navy and the Governor of New York. He was nominated as Vice President for the second term of William McKinley. Roosevelt became President upon McKinley’s assassination in 1901 and was later reelected for a second term. 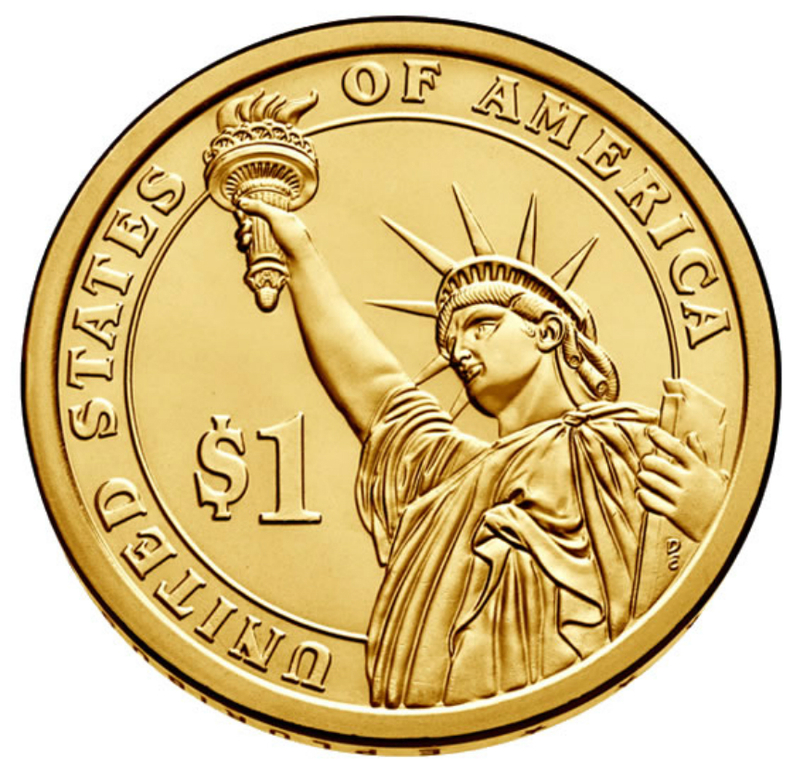 During his presidency, he personally commissioned sculptor Augustus Saint Gaudens to redesign the $10 and $20 gold coins, which marked the start of the Renaissance era of American coinage. Roosevelt is widely regarded as one of the greatest U.S. Presidents with notable accomplishments including trust busting, conservationism, and his receipt of the Nobel Peace Prize. 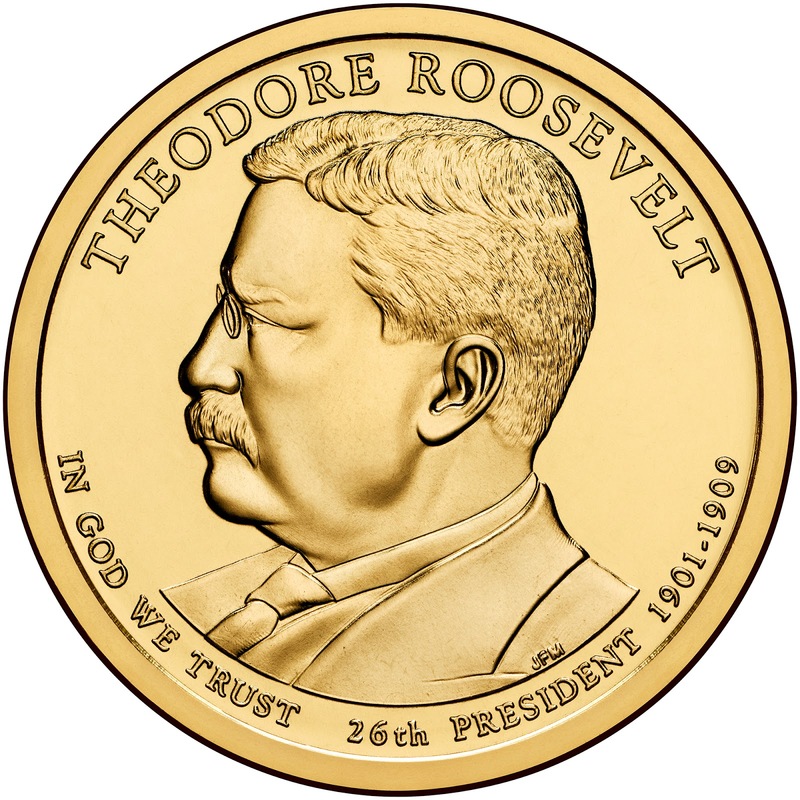 The Theodore Roosevelt Presidential Dollar features a portrait designed and sculpted by Joseph Menna. 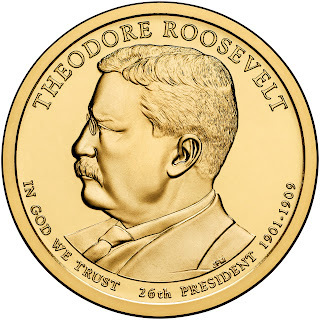 Inscriptions surrounding the portrait include “Theodore Roosevelt”, “In God We Trust”, “26th President”, and “1901-1909″. 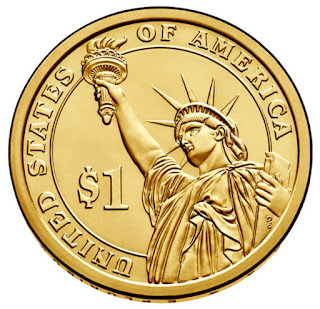 On the reverse of the coin is an image of the Statue of Liberty designed by Don Everhart with inscriptions “United States of America”, and the denomination “$1″. The edge of the coin includes the date and mint mark. Following a decision of the Treasury Department, the 2013 Theodore Roosevelt Dollars were not released though the channels of circulation. Instead, the United States Mint offered circulating quality examples of the coin within bags, rolls, and boxes, which were sold at prices reflecting a premium to face value. Sales for these products officially opened on April 14, 2013. Across the Philadelphia and Denver Mint facilities, total production of circulating quality examples of the coin reached 9,230,700 pieces, up by more than one million from the level of the prior release. On September 3, 2013, the United States Mint offered the 2013 Theodore Roosevelt Presidential Discovery Set. This was an educational product targeted towards children. 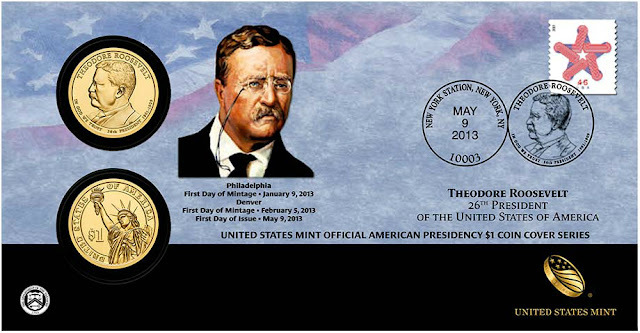 Each set included one 2013-P Theodore Roosevelt Presidential Dollar incorporated into an informational folder highlighting key milestones and accomplishments within the President’s life. The sets were priced at $9.95 and limited to an issuance of 20,000 units. A second special numismatic product known as the 2013 Theodore Roosevelt Coin and Chronicles Set was offered on December 17, 2013. This more upscale product included a proof 2013-S Theodore Roosevelt Dollar, the Bald Eagle National Wildlife Refuge System Bronze Medal, and a 99.9% silver version of the Theodore Roosevelt Presidential Medal. Educational materials were also included which highlighted the 26th President’s legacy as a soldier, statesman, and conservationist. The sets were priced at $57.95 each with no stated product limit. A sell out occurred the following year at last reported sales of 15,145 units. Theodore "TR" Roosevelt (October 27, 1858 – January 6, 1919) was an American statesman, author, explorer, soldier, naturalist, and reformer who served as the 26th President of the United States from 1901 to 1909. As a leader of the Republican Party during this time, he became a driving force for the Progressive Era in the United States in the early 20th century. Born a sickly child with debilitating asthma, Roosevelt successfully overcame his health problems by embracing a strenuous lifestyle. He integrated his exuberant personality, vast range of interests, and world-famous achievements into a "cowboy" persona defined by robust masculinity. Home-schooled, he became a lifelong naturalist before attending Harvard College. His first of many books, The Naval War of 1812 (1882), established his reputation as both a learned historian and as a popular writer. Upon entering politics, he became the leader of the reform faction of Republicans in New York's state legislature. Following the deaths of his wife and mother, he took time to grieve by escaping to the wilderness of the American West and operating a cattle ranch in the Dakotas for a time, before returning East to run unsuccessfully for Mayor of New York City in 1886. He served as Assistant Secretary of the Navy under William McKinley, resigning after one year to serve with the Rough Riders, where he gained national fame for courage during the Spanish–American War. Returning a war hero, he was elected governor of New York in 1898. The state party leadership distrusted him, so they took the lead in moving him to the prestigious, but considered by them powerless, position of running for vice president as McKinley's running mate in the election of 1900. Roosevelt campaigned vigorously across the country, helping McKinley win re-election by a landslide on a platform of peace, prosperity, and conservatism. Following the assassination of President McKinley in September 1901, Roosevelt, at age 42, became the youngest United States President in history. Leading his party and country into the Progressive Era, he championed his "Square Deal" domestic policies, promising the average citizen fairness, breaking of trusts, regulation of railroads, and pure food and drugs. Making conservation a top priority, he established myriad new national parks, forests, and monuments intended to preserve the nation's natural resources. In foreign policy, he focused on Central America, where he began construction of the Panama Canal. He greatly expanded the United States Navy, and sent the Great White Fleet on a world tour to project the United States' naval power around the globe. His successful efforts to end the Russo-Japanese War won him the 1906 Nobel Peace Prize. Elected in 1904 to a full term, he continued his pursuit of progressive policies, but many of his efforts and much of his legislative agenda were eventually blocked in Congress. Roosevelt successfully groomed his close friend, William Howard Taft, to succeed him in the presidency, and after leaving office, went on safari in Africa and toured Europe. Returning to the USA, he became frustrated with Taft's approach as his successor, trying but failing to win the presidential nomination again himself in 1912. He then founded his own party, the Progressive, so-called "Bull Moose" Party, and called for wide-ranging progressive reforms. The split allowed the Democrats to win both the White House and a majority in the Congress in 1912, and Republicans aligned with Taft would control the Republican Party for decades. Frustrated at home, Roosevelt led a two-year expedition in the Amazon, nearly dying of tropical disease. During World War I, he opposed President Wilson for keeping the U.S. out of the war against Germany, and offered his military services, which were never summoned. Although he planned to run again for president in 1920, his health quickly deteriorated, and he died in early 1919. Roosevelt has consistently been ranked by scholars as one of the greatest U.S. presidents. His face adorns Mount Rushmore alongside those of George Washington, Thomas Jefferson, and Abraham Lincoln.